Social media gets a bad rap these days, but here in Smyrna/Cobb we have several Facebook groups, formed by local parents, who are actively (and rapidly!) changing our community for the better. This is Part II in our series highlighting these incredible groups. 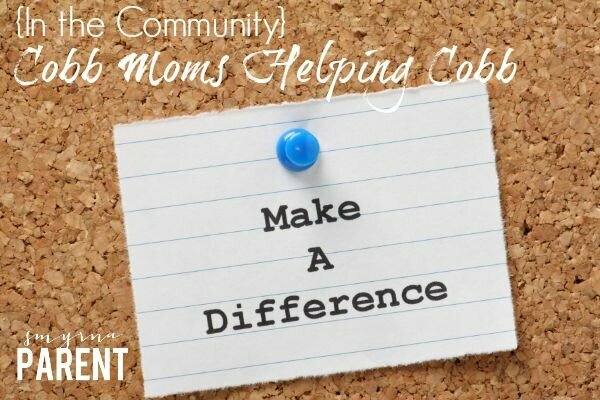 Cobb Moms Helping Cobb is a Christian-based network of women in Cobb County who assist non-profit agencies better serve those in need. We disseminate information, donate, volunteer and raise awareness of our community’s social issues and area nonprofit agencies. We also aid individuals with unique circumstances whose needs are not met by existing programs. I learned about them last Christmas as Smyrna Parent was working on an article about holiday-specific volunteer needs, and since then I’ve been in awe at the generosity and mobility of our community here in Cobb. While the needs are great, and I’m sure constantly flowing in, I’ve repeatedly seen the calls for help met time and time again — often so quickly that by the time I see a post calling for help, the need is already filled! To learn more about this group I thought it best to hear straight from Rebecca about why she started it and where she’d like it to go. (1) What prompted you to you start this Facebook group? I am a stay-at-home mom and former social worker. I was led to a local ministry that serves women and children. I sat with these moms and heard their stories. I saw many turned away because there was no room. There was nowhere for them to go. This led to me meeting families living at extended stay hotels. I had no idea across the street from where my kids play at Town Center mall, children are homeless and hungry. The magnitude of this hidden need in our community was shocking. As I was meeting these families, I was simultaneously hearing from moms wanting to give back to the community and teach their children service and gratitude. Moms needing help. Moms wanting to help. Both kept crossing my path, nudging me to act. The result was Cobb Moms Helping Cobb. We began as 32 moms assisting one specific nonprofit. We have grown to over 750 moms serving numerous agencies and families. (2) How do you hope to see it grow in the next few years? God’s hand is all over our group and our work, and He has created a beautiful, loving and supportive village. I hope people can see Christ’s love for them shining through in the work we do. I hope they will see their value and know they are not alone. I hope relationships continue to flourish and grow. Both sides often get so much out of meeting, it’s hard to know who is the mom helping and who is being helped. (3) How do you find/vet the families, charities, or events that you share with the group? When we began, I introduced Cobb Moms to some of the area agencies. Once we started assisting them with volunteers and in-kind needs for their clients, word spread quickly. Agencies often contact us when a specific need arises. We have had the honor of assisting Cobb Street Ministries, MUST Ministries, Simple Needs GA, Alive Ministries, Cobb County Schools, Family Promise of Cobb County, DFCS and others. The families we assist are referred by agencies, social workers, hotel employees and Cobb Mom members. Some learn of us from others we have helped or find us on Facebook. There is a screening process to ensure the family is in need and community resources have been exhausted. We try to help them develop a next action step to promote stability. We promote events that support local non-profits that serve people in need. They work tirelessly for our community and need the support of all of us to continue the work they do. We often create our own events or projects, involving our children as much as we can. When we see an unmet need in our community, we act. For example, 1 in 4 children in Cobb County is hungry. That is completely unacceptable. We moms united and served 821 lunches to children living in an extended stay hotel this summer. We provided a social worker who has 50 homeless students with 80 bags of food. Last Thanksgiving we realized hotel families were given baskets of food they could not cook. We served an entire hotel a Thanksgiving feast. Their favorite part? Being able to eat together as a family. There is no dining table in the hotel rooms. (4) Where/what are Cobb County’s greatest needs right now? Food insecurity is a real issue in Cobb County. Food is always needed, as well as diapers, baby wipes, toiletries, and toilet paper, which are not covered by food stamps. Families also need financial assistance with hotel rooms, gas and child care until CAPS is approved. On a macro level, the greatest needs are affordable housing, expanded public transportation and more emergency shelters and transitional housing programs for families. Cobb County ranks first in the entire United States for having the fewest available and affordable housing units for extremely low income households. There are only 2.8 affordable units for every 100 households. (Urban Institute, 2014). This leaves families homeless, sleeping in cars or moving into hotels which cost their entire paycheck. Cobb County’s limited bus service severely restricts employment and housing options. Existing family emergency shelters and transitional housing programs are wonderful and work tirelessly but are maxed out. They turn people away daily because there simply aren’t enough beds. (5) Is there a specific current or upcoming effort that you’d like to promote right now? In recognition of Childhood Cancer Awareness month, we are doing a toiletry drive to benefit CURE Childhood Cancer of Atlanta. Unopened, travel sized toiletries are needed. Kits will be assembled and given to families of inpatient pediatric cancer patients at CHOA. Items can be dropped off at Northwest Family YMCA, Gigi’s Cupcakes in Kennesaw and Marietta, and Cumberland Community Church. (6) And a bonus question since you are so in touch with the needs of our local market: What are the best ways to introduce young children to volunteer work/community service? There are a few opportunities for young children in our community. Meals on Wheels is fantastic to do with young children. I began that with my kids when they were all under 4. They loved it more than the seniors. The Northwest Family YMCA allows young children to make and serve lunches during their summer, winter and fall feeding program. Neighbor Love does dinner parties for seniors in nursing homes on holidays. They love for young children to come mingle and eat with the residents. Families or groups can always create their own service project, such as rolling silverware or hosting a food drive for MUST Ministries, having a toy drive for Simple Needs GA, or making cards for our military. If you’d like to join Cobb Moms Helping Cobb, please request to join their Facebook page.